Patrick, you have been working at Blackeight for four months now. Tell us something about you, what did you do before your time at Blackeight and how did you get to us? I am 23 years old, I come from Frankfurt and have studied Business Administration with a focus on Marketing / Marketing Research at the University of Applied Sciences in Mainz. I have worked at a market research institute as a working student in the consumer and customer department for more than one year. After that I wanted to gain experience in Brand Consulting as well. When I noticed the job posting at Xing, I checked Blackeight’s ratings on kununu and applied for the job. I really appreciate that I am included in the whole project work. That’s why the learning curve here is very steep. I can take over very exciting and challenging tasks and colleagues help me whenever I have a question. Generally speaking here is a very nice and easy-going atmosphere and I can participate actively in every project step. What impresses me most is how people approach tasks differently here. Every colleague has a special field with its own methods. Every project team has different concepts. That’s why I get to know a lot of different perspectives and approaches. Can you imagine working as a Brand Consultant after your internship? Definitely. The work as a Brand Consultant is very interesting. There are a lot of parallels to the work as a Research Consultant. You analyze companies, their target groups and competitors, identify trends and develop solutions for customers. In this case a strategy. The difference is that the focus here lies in brand management and the customer gets accompanying consultation even after the development of the strategy to implement it. 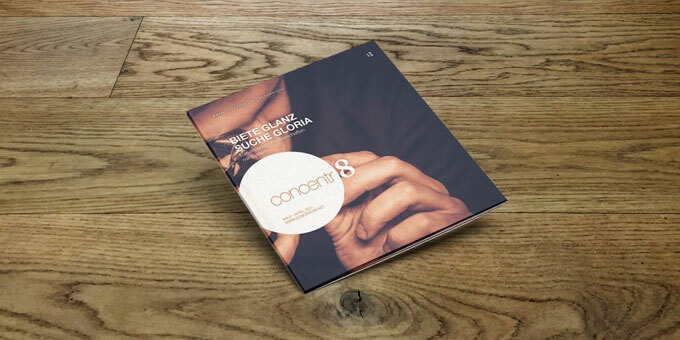 As a Brand Consultant you have exciting projects and a lot of challenges to face. From designing the workshop, to developing scenarios to the implementation of the strategy. Thanks Patrick for sharing your impressions with us. 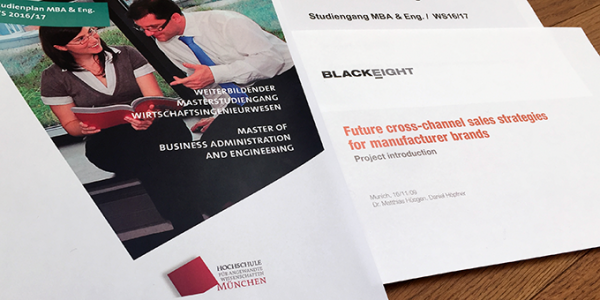 Upon the invitation of Prof. Dr. Daniela Cornelius, Munich University of Applied Science, Dr. Matthias Hüsgen and Daniel Höpfner presented a project task for the part time master programme in business administration and engineering in winter semester 2016/2017. The 30 students explored »Future cross-channel sales strategies for manufacturer brands«. After a keynote speech about Blackeight’s consulting experiences, the students pointed out special challenges manufacturer brands have to face in the online- and offline sale and identified best practices. Over a three weeks period, ten project groups worked out concepts for an integrated online-/offline sales strategy and presented new approaches that include the stationary specialist trade. 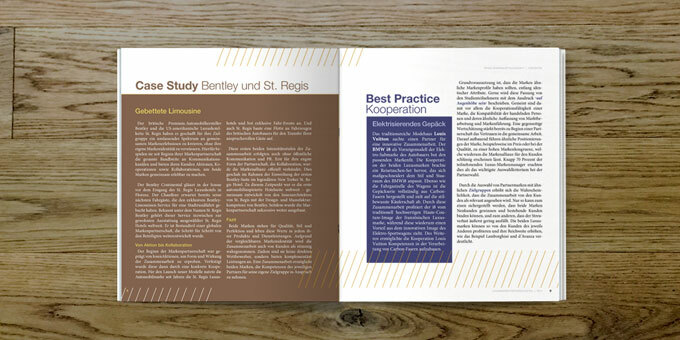 »The close cooperation with committed students leads to interesting impulses and the opportunity to communicate the benefit of a systematic brand management in part time studies in an interdisciplinary way«, summarizes Dr. Matthias Hüsgen. The Peruvian clothing manufacturer Tela offers products which are of higher quality, more sustainable and less expensive than the competitive environment. But which of these messages communicates the best competitive advantage? 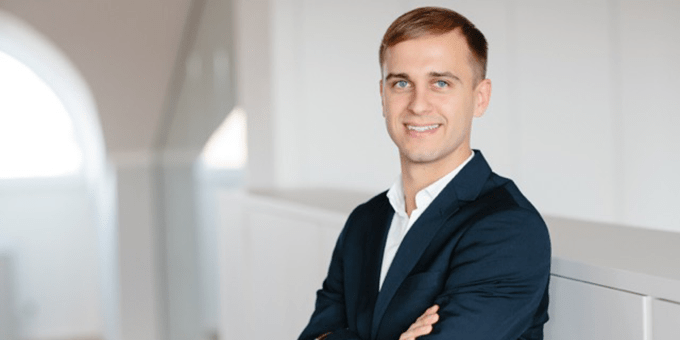 Three experienced brand experts – one of them being Armin Schlamp, Managing Partner at Blackeight – evaluate this case of the Harvard Business Manager. In his comment Armin Schlamp points out why a brand should be strategically positioned first before defining exact messages for target groups. Instead of giving gifts this year, we are supporting the SOS-Kinderdorf e.V. in Germany. Our donation supports the project »Frühe Hilfen« in Augsburg, which helps parents with children in need. Starting January 2017 we expand our management team with Andreas Thoma and strengthen our portfolio. The full post is only available in German.